In all truth, I was originally never going to tell this story. Because for the longest time, I didn’t even know if there was a story. I didn’t take what had happened to me seriously. Sexual harassment, unwanted sexual attention, grabby or flirtatious old men; we’re taught as women to make excuses for them, especially as black women. You’re supposed to be A-OK with a touch here, a squeeze there, a dirty look, or even an unwanted grab. You’re supposed to laugh—act grateful, even—for the attention. Even if you never wanted the attention in the first place. What happened to me was something that was so casual, I almost didn’t even consider it sexual harassment, even though it was beyond my desire. I used to work for a very popular media company, and we had a meeting that ended with a keynote speech by the living legend, the Rev. 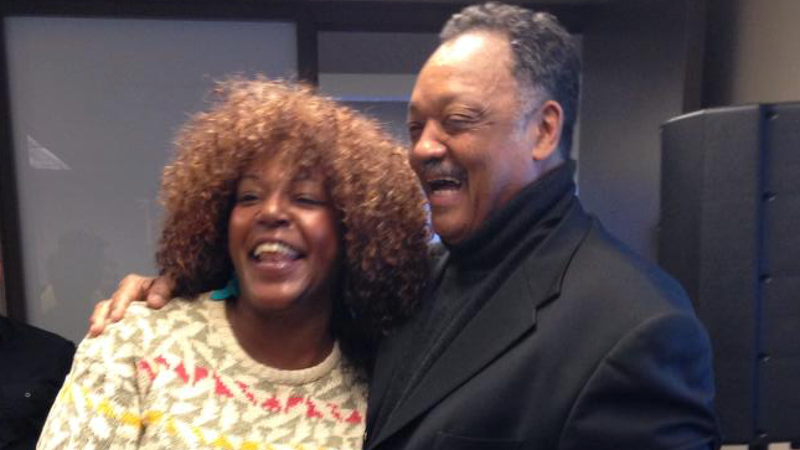 Jesse Jackson. So, of course, the conference room was packed wall-to-wall. After Jackson’s riveting and inspiring speech about the responsibility of black journalists, we all lined up to take a photo with him. One by one, we stepped up, shared a few words and thank-yous with Jackson, snapped photos and went back to our desks. Simple enough, right? I walked toward Jackson, smiling, and he smiled back at me. His eyes scanned my entire body. All of a sudden, I felt naked in my sweater and jeans. As I walked within arm’s reach of him, Jackson reached out a hand and grabbed my thigh, saying, “I like all of that right there!” and gave my thigh a tight squeeze. I was shocked, to say the least. Even though Jackson had had his hand reached out, I had no idea that he would touch me in a sexual way. I did what most women in an uncomfortable position do: I giggled. And I continued to giggle as he pulled me in closer, stared down at my body, smiled and told me he was only kidding. The entire time, my co-worker snapped photos. In many of the photos, you can see that I am visibly uncomfortable but attempting to laugh it all off. In the last photo, I am pointing to the camera, asking him if we can just take the picture. When I was finally able to pull myself away from the Rev. Jackson’s grip, I was deflated. I admired this man who marched alongside the Rev. Martin Luther King Jr., a man who represented our ability to overcome, a man who is really ... just a man. I personally never wanted to say anything because my situation was just a thigh grab. Barely a blip on anyone’s radar, even my own. Jackson’s tight grip doesn’t even measure up to what any of the victims of Harvey Weinstein and others have had to endure; however, I was uncomfortable and had to swallow the lump in my throat as I stood right beside the civil rights leader. Honestly, I think it’s worth it for women to speak out against men who simply can’t keep their hands to themselves. Because that’s where it starts. My silence gave Jackson permission to continue grabbing at the next pair of thick thighs he liked. I’m hoping that my voice does the opposite. Mr. Weinstein has a different recollection of the events, but believes Lupita is a brilliant actress and a major force for the industry. Last year, she sent a personal invitation to Mr. Weinstein to see her in her Broadway show Eclipsed. What did I say about people believing black women? Oh yeah, they don’t. It’s no coincidence that out of all the women who spoke out, Nyong’o was not only targeted, but challenged, as if her story couldn’t possibly have been true or even mattered. Coupled with the embarrassment and humiliation many women feel after being sexually assaulted, black women have to worry about their story lacking credibility. And this is why we either hesitate to speak out or don’t speak out at all. A few of my co-workers saw Jackson’s hand grip my thigh as it was happening, and they laughed harder than I did. Their laughter didn’t feel like the same type of nervous laughter I had when my thigh was in his hand. Theirs was as if they had just heard the best joke ever. It was almost an encouragement of Jackson’s behavior. I’m not blaming them; I’m just curious as to why most of them thought what happened was more funny than alarming. That’s concerning. I think most women have to deal with unwanted sexual attention, and we just chalk it up to being a part of our lives—yet another thing we have to develop a callus against. His laugh suggested that he thought his sexual harassment was hilarious. I left the restaurant without even completing my order. As I walked out, I heard the man say, “Damn, sis, did I offend you?” What do you think, genius?! Many of us grow callous and become numb to the daily wear and tear of causal, unwanted sexual attention. But there are times when the advances are so bold, the moments can’t help but stick out. Bringing up the memories of a handsy Jackson also reminded me of another black man of power who rubbed me the wrong way literally. A few months ago, I went to the American Black Film Festival, and one of the interviews I landed was with John Singleton and the cast of his new show, Snowfall. The interviews took place in a room filled with public relations executives, ABFF officials, myself and my camera crew. When I walked into the room, I heard Singleton say something, and I heard enough of it to know it was about me. But I ignored it. Thank God for my callus. I only had about four minutes to interview him, so I was in go mode. He was sitting in a director’s chair, so when he pulled me, I fell forward and stopped myself by placing my hands on his legs. He then leaned forward and kissed me on my cheek. I said, “Oh, oh, OK,” and stood up, embarrassed because everyone was definitely still in the room. Mostly, no one reacted, aside from a few seconds of laughter. A few people asked Singleton for a photo, and I didn’t. He noticed. When he was about to leave the room, he asked if I wanted a picture. In order not to make it awkward, I said yes. He grabbed me around my waist and pulled me into him, saying, “Oooh, I’m gonna grab on tight to you.” I laughed, because that’s what I do when I am uncomfortable, and snapped the photo. When I posted the photo on Instagram, I admitted to his sexual advances, but I kept it light with humor. A therapist would tell me that’s a defense mechanism. For me, it was a mix of two things: the casualness of his advances and the way no one in the room reacted. I normalized it and made myself believe it was no big deal. Singleton was just being a man. Also, it’s John Singleton! One of the perks of my job is that I get to meet people I’ve looked up to my entire life. I am a young black woman from North Carolina. When I decided I wanted to be a journalist, I had no idea the job would lead me into places and spaces where I’d connect with people I’ve personally celebrated. My family and I watched Singleton’s films, and I never dreamed of meeting him, much less talking to him. It’s never lost on me that I get to be in the same room with people I love and respect. Despite the disappointing feeling of the circumstances of meeting him, I can’t deny the excitement and what it means to me to share that with the people who watch and support my journey. The woman’s admission was so pedestrian, I was convinced she was simply reacting the same way many women do to unwanted sexual attention—she ignored it. I tried to ignore it, but I felt weird. I couldn’t believe she was telling me to ignore my better judgment and my skin-crawling to make a man who doesn’t respect boundaries my sugar daddy. I felt like I should never have said anything. Ever since I was a little girl, I was warned about dirty old men, but not in a way that held them responsible—it was often in a way that made sure I steered clear or that I dressed and behaved appropriately enough so as not to attract their attention. This was embedded in my brain and how I behaved throughout my life. So when the unwanted sexual attention came, and it always did, I blamed myself. But no woman should do that. I shouldn’t do that. It’s not my fault if a man wants to turn a professional environment into a playground of flirting, grabbing and sexual talk. I didn’t ask for the attention just by existing. No one asks for the attention by just being themselves.